Rogue adverts are showing up on London’s tube network and bus stops, opposing Brexit and standing up for freedom of movement. The unbranded posters, which have apparently been put up without permission, started being noticed on Tuesday. 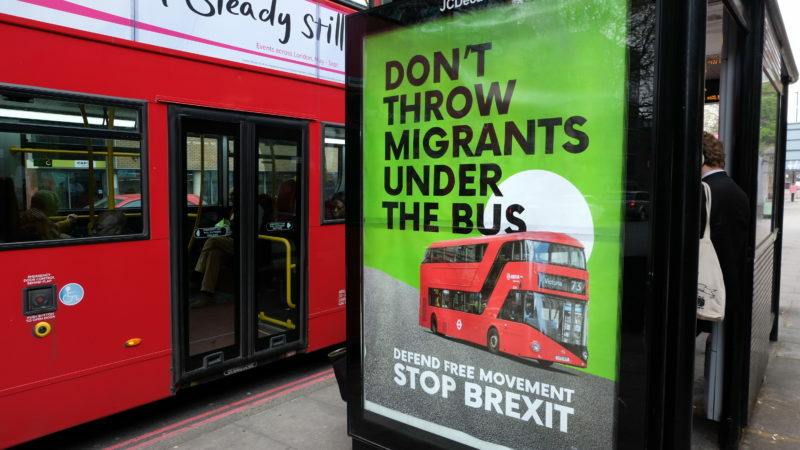 The adverts have a variety of slogans, including “Don’t throw migrants under the bus – defend free movement” and “Possible closures expected – defend free movement”. A spokesperson for Another Europe is Possible told Left Foot Forward that he had “no idea” where the ads had come from, adding “but it’s great to see eye catching materials making an unapologetic case for free movement. Labour’s current policy is that ‘free movement will end after Brexit’, but there are growing calls for the party to shift. Last week Shadow Home Secretary Diane Abbott insisted that Labour will put economic prosperity ahead of ending free movement of people from the EU in any compromise Brexit deal. Tuesday evening update: A TfL spokesperson said “This is not an authorised advert. It is fly posting, which we take extremely seriously. Josiah, that’s the major reason why people voted leave. You want to force them to pay so you get your cheap baristas. Selling state resources below cost when you don’t have to is stupid. The WA is a disaster. The UK has to fund low paid migrants for the rest of their life. The reverse is not the case. EU countries can kick brits out. £ 13.11 per week to £681.72 per year so that’s a net spend of £13,818.28 not the £14,500 you imply. Not all migrants are minimum wage earners, in fact all of the migrants in my company earn significantly more than the minimum wage. Not all minimum wage earners are migrants. I didn’t know that baristas were state employees or that the cup of coffee that I buy is below cost. Stephen, nhsgp is for amusement only! We can be fairly sure the ads aren’t funded by dirty money from the Isle of Man or by Russian agents! To NHSGP. Do you agree with me that employers should be compelled to pay enough wages so that you and I don’t have to subsidise them? It’s the employers you should be criticising. Eric Walker – how much immigration is enough? nhsgp, the UK, under EU law, can send migrants home after 3 months if they don’t have a job, it’s just that the UK doesn’t bother enforcing where as other EU countries do. On average, immigrants contribute more to the UK government than they receive. nhsgp’s comment is therefore from bias, not logic… so I do hope he/she is not an nhsgp, I expect better from them. But I would prefer to see them emphasising the forgotten part of FOM (the bit about British people having freedom to live, work and retire overseas). The narrative is always about immigration (and people associate the word migrant with immigration… less so freedoms of emigration).